At some point or other, we have all heard a version of the tale of the phantom hitchhiker. And while there are many variations, the basics of this well-known story always remain the same – a traveller picks up someone standing by the side of a lonely road, but at some point on the journey home they discover their passenger has mysteriously vanished. This classic chiller is said to have occurred all around the world, but one of the most famous examples of it is the haunting at Blue Bell Hill. In the heart of Kent, a road which connects Maidstone to Rochester runs over Blue Bell Hill, which the site of the remains of a Roman temple. As is usual for such ancient locations, the area has accumulated a certain amount of folklore and strange tales over the years, but the famous hauntings seem to have begun relatively recently with a terrible road crash. On the 19th of November 1965, a Ford Cortina was carrying four young ladies to the Running Horse pub in Maidstone. But along the way, by Blue Bell Hill, their vehicle a terrible accident occurred. No one is sure what caused the crash, but ultimately it took the lives of the three of the quartet, including one young lady who was to be meant to be getting married the following day. By the mid 1970s, tales began to circulate in the local area and popular press of eerie figures encountered on the road, often a young woman in white, with some versions reporting she wore a bridal dress. However over the years other figures were reported too, children and old hags, and little by little the Blue Bell Hill area has gained a reputation for being something of hotspot for paranormal activity, with stories of weird cryptids, such as a gorilla-like creature and phantom black cats, being spotted in the area. It would seem that once an eerie story sprouts upon a landscape, it soon proliferates, and others soon come to join it. Now there has always been a lot of cross-over between the world of folklore and weird fiction, with Bram Stoker drawing on many old legends to create the modern pop culture incarnation of the vampire, while MR James and many tellers of ghostly tales who followed him have often inspiration in local legends and historical curiosities. However once what were once called gothic, weird fiction or sensations novels had coalesced in the early 20th century into the modern horror genre, increasingly creators looked not to the strange stories told by the fireside or passed around the local area, but instead reworked, reanimated and revises tropes and concepts from early horror stories instead. However in the late ‘60s and early ‘70s the seeds were sown for a new sort of horror, or rather some old wild terrors reappeared in the field. And whichever way you wish to look it, these works which looked again to the lore of the countryside and the landscape of old stories, have blossomed into today’s folk horror revival. Now one of most interesting new voices to emerge in the current folk horror revival is writer Thom Burgess who has been busy creating a series of deliciously eerie little graphic novels. 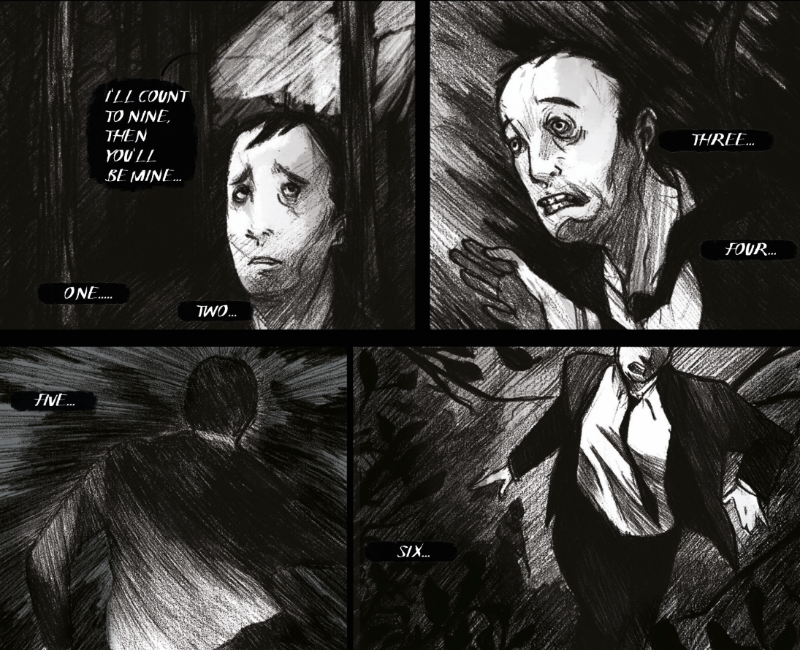 In his first venture in collaboration with artist Joe Becci, we explored the lore of haunted houses in Malevolents – Click Click (2014). This accomplished chiller was followed by The Eyrie (2017) in which Burgess this time teamed with Barney Bodoano brought us a fascinating and extremely creepy tale that explored all those old stories of smugglers creating ghostly tales to distract unwelcome eyes from their midnight activities. 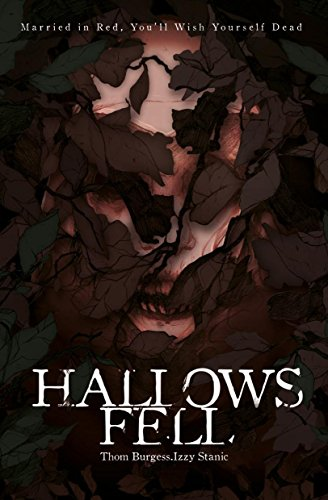 However while The Eyrie delivers some fine chills playing with these folkloric ghost stories within ghost stories, Burgess’s latest offering Hallows Fell goes on step further. This time partnering with artist Izzy Stanic, Hallows Fell has us ride shotgun with Simon, a businessman on his way home to his fiancee and a house-warming party. Now Simon is a city boy and this ill-fated trip into the countryside will see him very much out of his comfort zone and indeed rapidly become very out of his depth. For Simon’s route is to traverse Bluebell Hill after dark, and there we will discover that there is indeed a very dark truth to all the strange tales that have circulated about this area. On one hand, the story taps into our own experiences and anxieties – after all, haven’t we all at some point of other had a journey that turns into a nightmare, and indeed many of us will have ended up horribly lost on country roads trying to find the location of some event we are now late for. Indeed while Simon is not exactly a world champion nice guy, as his journey takes increasingly dark and sinister turns, you can’t help but feel a little for his plight. As with his previous excursions into horror comics, once again Burgess has teamed up with a highly individual artist, this time Izzy Stanic. And once again he has found a perfect partner for his script. While many comics are still following the time-honoured styles pioneered by House of Marvels or their Distinguished Competitors, Stanic’s art is delightfully unique, and has been very much tailored to the tale. Here we have clean lines married with thick shadows and dense pencil shading. She captures the look of rural England by night perfectly, from silhouetted woodlands and country pubs to lonely bus stops and deserted roads. in the middle of nowhere. It’s expressive and atmospheric, and when the script calls for it, truly haunting and horrific. However what also gives Hallows Fell additional power is the nature of the nightmares waiting in the shadows by the roadside. For Burgess explicitly draws upon the curious tales and haunting legends that surround the Blue Bell Hill area. And this isn’t just a case of using a single legend from local lore and dressing it up as a horror tale. Much like his previous tale The Eyrie this is a story that is about stories, and is clearly a development and anb an expansion of that approach. Here there is a layering of several different stories, with Hallows Fell weaving an intricate web of legend and lore, one that ensnares Simon and draws him closer and closer the dark source from which they spring. All in all, Hallows Fell is another crackingly creepy tale, offers a great deal of folkloric fear and fun for all you revivalist out there. Very much like the spooky folk tales that have inspired and informed it, it is dripping with eerie atmosphere, and like the benighted country lanes and roads it invokes, takes many dark twists and turns.